Since taking over the helm of Sime Darby Property Bhd a year ago, managing director Datuk Tunku Badlishah Tunku Annuar has been busy crafting up strategic plans to build on the company’s strength as a formidable local and international property player. The mega merger of Sime Darby Bhd, Kumpulan Guthrie Bhd and Golden Hope Plantations Bhd in 2007 has created the country’s largest property group in terms of landbank and ongoing developments. “The merger has allowed us to put in place strategic transformation initiatives to enhance operational efficiency as well as establish strategies for sustainable growth,” Tunku Badlishah says in a recent interview with StarBizWeek. Following the merger in November 2007, priority was placed on establishing a Target Operating Model by July 1, 2008. This entailed a complete review of the organisation structure and operating processes by adopting best practices within the merged entities and re-engineering the organisation to best deliver the strategies and synergies expected from the merger. For example, previously sales, marketing and customer service functions were centralised in the corporate headquarters. In an effort to improve the customer service and better understand the market, township offices have been established in each of the company’s ten townships. These offices are helmed by a township head with independent sales, marketing and customer service operations. Tunku Badlishah says a comprehensive review was also undertaken of the existing development plans for each of the townships and where possible, products and development phases were replanned to enhance development value. “Efforts were made to identify and execute projects that could increase the marketability of the townships for the benefit of existing and future residents,” he says. As an example, he says Phase 5T in Putra Heights was originally planned as a typical terraced housing project consisting of 22’ x 75’ and 24’ x 75’ houses with about 500 units on 57 acres of land and an estimated gross development value (GDV) of RM275mil. Taking into consideration its location at one of the most strategic areas in Putra Heights, The Glades has been re-planned as a premium gated development with meandering waterways and an exclusive lakeside club house with an adjacent retail complex – features that will enhance the project value and attract high-end buyers to the development. Scheduled to be launched in the first quarter of 2010, The Glades product mix totaling 409 units includes bungalows, cluster villas, courtyard homes and two-blocks luxury condominiums with an estimated GDV of RM700mil, a 250% increase compared to the original plan. Sime Darby Property has also pioneered a comprehensive Safe City agenda for its Ara Damansara township in its continuous efforts to create a safer living environment for its communities. Launched by Home Affairs Minister Datuk Seri Hishammuddin Tun Hussein on July 21, the initiatives are based on the Safe City criteria set by the Federal Department of Town and Country Planning, Ministry of Housing and Local Government. Tunku Badlishah says the success of Sime Darby Property’s township projects so far show the merged entity has been well accepted by the public. Having a common marketing platform such as the Parade of Homes Series, allows for the promotion of the company’s ten townships under a single initiative. “We are constantly looking at innovative ways on how to assist potential homebuyers make their home ownership dream a reality. One of our most successful marketing initiatives is the Parade of Homes Series which was launched in June last year. “The overwhelming response from homebuyers to the three campaigns so far exceeded our expectations. It is an indication that despite concerns over the economic climate, home ownership remains a priority among Malaysians. “We just need to come up with out-of–the-box marketing ideas to give them the confidence to make that decision to purchase,” he adds. Its latest Parade of Homes from March 6 to June 15 managed to record sales of 1,657 housing units worth more than RM1bil, by far the highest sales since its first launch last year. “It is a major accomplishment given the weak economic environment that has negatively impacted the property industry,” Badlishah says. Post merger, the company has also given top priority to research and development innovation. Tunku Badlishah believes the future success of the company is dependent on its ability to create desirable, innovative and environmentally-friendly products by establishing new typologies, utilising new materials and construction methodologies and collaborating with cutting-edge technology providers. Synergistic operational efficiency in research and development, product innovation and marketing will ensure the merged Sime Darby Property becomes a leading industry player in product offerings and sales going forward. 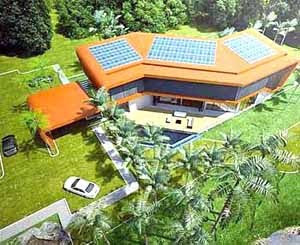 The Sime Darby Idea House is a socially, economically, and environmentally responsive prototype dwelling that provides an insight into future tropical living. “One of the key initiatives of the year is the Sime Darby Idea House where we are showcasing the latest in construction solution, system applications which will be an example of how green architecture, good design and sustainable living can work harmoniously. “The Sime Darby Idea House is a socially, economically, and environmentally responsive prototype dwelling that provides an insight into future tropical living. “Conceived as a test bed for new ideas, the house showcases the latest in sustainable architecture in the buildings’ quest to become the first carbon zero residence in South East Asia,” says Tunku Badlishah. Sharing his passion for the project, Badlishah says the Idea House will be a self sustaining building that generates power from the sun, reuse harvested rain water and is built entirely on the principle of modular construction where the user would be able to expand and contract the building as the need arises. The entire frame and construction is modular to provide not only a speed and ease of construction, but also the ability for the house to be demounted in the future in order to preserve the terrain for future generations or future development. Another initiative is The R&D Village which is a 20-acre experiment facility to be located in Elmina East. Tunku Badlishah says the facility will be the testing platform to analyse various performance aspects of the company’s latest prototype designs. “Working closely with our vendors and suppliers, the R&D Village will test and demonstrate new building products, construction technologies and system applications to the public in order to evaluate the response of the market. “What we hope to offer to our partners is an opportunity to test and showcase products that have not been available or generally associated with regular home offerings,” he further explains. He says the merger has allowed Sime Darby Property to take advantage of its increased scale by negotiating better terms with its vendors for the benefit of purchasers. Significant cost savings and quality improvements have been achieved through identification of preferred vendors and negotiating pricing based on estimated annual requirements. “Sime Darby Property is giving preference to vendors whose manufacturing process and products are “green” and “sustainable”. “Quality has been enhanced as contractors are required to utilise specialist installers/applicators nominated by the preferred vendors and the product warranties are issued directly by the manufacturer to the purchaser,” he elaborates. So far, the new procurement initiative has resulted in savings of up to 20% on certain building materials. Tunku Badlishah says construction costs have also been reduced by combining construction contracts that are within the same location, as it has resulted in significant savings on the cost of preliminaries and mobilisation. SIME Darby Bhd is a well-diversified conglomerate with operations in 20 countries and 70% of the group’s income is derived from outside Malaysia. 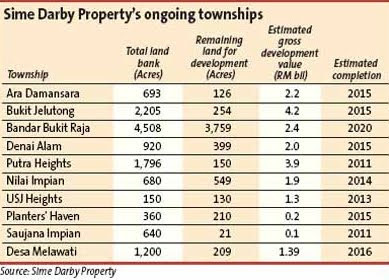 In comparison its property subsidiary, Sime Darby Property Bhd, with footprints in six countries, derives only 10% of its income from overseas. “We can leverage on the group’s global presence and it will be easier and less risky for us to penetrate the new markets where the Group already has a presence. To realise our international aspirations, we will be leveraging on the strong reputation and global reach of the parent company,” Sime Darby Property managing director Datuk Tunku Badlishah Tunku Annuar says. Currently Sime Darby Property has property related interests in Singapore, Indonesia, Vietnam, China, Australia and the United Kingdom with business activities that include asset management, hospitality and leisure, strategic investment and property development. According to Badlishah, Singapore has been the company’s most successful international market to-date. Given the limited land availability in the city state, most of its projects involve redevelopment of low-yielding properties into high value assets. The timing of its recent condominium developments in Singapore has been fortunate and the company has managed to sellout its properties at the peak of the market and gain maximum value out of the projects, just before the global financial meltdown last September. One good example is The Orion which was originally an old service apartment block with very low building efficiency within the vicinity of Orchard Road. Upon redevelopment, 46 luxurious residences on a 27 storey condominium block were built and sold. The return on investment was a remarkable 63%. Another successful project, Balmoral Hills is an exclusive freehold residential development at Balmoral Park in the prime District 10. The 62 apartments measuring more than 1,300 sq ft to 1,841 sq ft have gross development value of RM344mil. In Australia, Sime Darby Property is developing Eagles Cove, an exclusive residential development on Queensland’s popular Gold Coast. A joint venture re-development project of 250 acres of prime freehold land, it comprises high-end waterfront resort bungalows, low rise apartments and commercial units. The A$529mil project is planned for launch in mid 2010. Badlishah says Eagles Cove is a unique example of a creative re-development initiative by the company in Australia. “After the acquisition, we have undertaken some improvements to the site and provided linkages and access from an existing lake to the open sea. “The creative engineering work has provided residents access to the open sea via a private lock which provides a non-tidal, secure environment for residents to moor their boats. The effort has significantly enhanced the value of the property,” he adds. Other hospitality projects that have been completed Down Under include The Karri Valley Resort near Perth; and Quest Margaret River and Quest Subiaco in Western Australia. The vast China market is also beckoning Sime Darby Property to expand its presence there. Sime Darby Property first ventured into the China market via a joint venture development called Richmond Park in Beijing. After exiting the successful Richmond Park project in November 2007, the company has been actively pursuing new development opportunities in China. Sime Darby already has a presence in Weifang, a coastal city located within the fast growing Shandong Province, through ownership of ports and a water treatment plant and Badlishah says that Sime Darby Property is in the midst of acquiring two land parcels of 163 acres and 224 acres in Weifang. The estimated gross development value (GDV) for the land parcels is estimated to exceed RM3bil upon completion in 10 years time. United Kingdom is also under the radar of Sime Darby Property. Its presence in the UK is through Sime Darby London Ltd (SDLL) which has acquired a property in Bognor Regis for about £10.5mil. Recently, the company signed a conditional sale agreement to sell part of the property for £26.5mil. “With Britain’s property prices having dropped by some 40% and 50% since the global financial crisis, there are ample opportunities to pick up good assets at depressed prices. Our management is eager to explore London’s West End for some good low priced assets that are up for sale there. In the next few weeks, we will be putting in our bids for some open tenders. We believe there are still many opportunities to shop around for some good bargains in Britain,” Badlishah says. With its wide geographical spread and relentless efforts to expand further, Sime Darby Property may become a household name in many other cities around the globe in the years to come. The main growth driver for Sime Darby Property Bhd in the coming years will be the development of Sime Darby Vision Valley (SDVV), according to managing director Datuk Tunku Badlishah Tunku Annuar. The ambitious development has been conceptualised in line with the National Physical Plan which calls for the development of the Kuala Lumpur Conurbation. Stretching across the state of Selangor and Negeri Sembilan, the KL Conurbation covers an area of 1.2 million acres of which 126,000 acres belong to Sime Darby. Of this, 80,000 acres have been earmarked for development. Tunku Badlishah says SDVV will strengthen the country’s position as a preferred global destination for the promoted sectors within the development that include tourism and entertainment; healthcare and wellness; education; green tech park, sports; and aviation-related industries. A master-planned project that will span two decades, SDVV is expected to generate a GDV of between RM25bil and RM30bil. He adds that Sime Darby Property is in the final stages of fine tuning the master plan for the mammoth project which is expected to be finalised in the next two months. The first new township to be launched by Sime Darby Property will be the 1,000-acre Elmina when it rolls out early next year. Says Tunku Badlishah: “The merged Sime Darby Group is committed to developing sustainable futures and Elmina East will be the first township launched post-merger as part of the SDVV master development plan. Elmina East will have an average of 80% permeability which means in a neighborhood, a person would be able to walk anywhere within a 380m radius within five minutes in 80% of that area. “Our study shows that this is almost 30% higher than some of the best existing townships in the country,” he notes. The company is also planning to connect the township via a network that rides on High-Speed Broadband Services (HSBB) to reduce travelling time in physical networking. This in turn would allow business within the township to focus on productivity. “We anticipate an increase in teleworking or flexi-hours when HSBB comes on live. “We anticipate at full maturity, we would see businesses in Elmina reduce up to 2.5 tonnes of CO2 emission per person per annum; that is equivalent to a reduction of 40% per capita emission. “In addition, we have also created vehicle-free zones in key commercial areas that will encourage better interaction between the residents and their surroundings. “We also intend to create a series of infrastructure services that are connected by a convergence system – that means our water, common facilities; security and communication can be centrally managed,” Badlishah further explains on the plan. Elmina East will be served by an integrated water-management solution which covers management of clean water, treatment and conditioning of grey water that is collected from surface run-offs and domestic grey water; and treatment of black water from the sewage plants. The company is also working on developing a Building Automation System (BAS) that will be a given feature in all its houses. “The BAS will allow better management of security, energy and climate control of the houses. We anticipate our residents would enjoy savings of up to 57% from power consumption by applying an efficient BAS application alone,” he says. Based on the Building Research Establishment’s (BRE) Sustainable Development Excellence Framework that promotes components for sustainable communities, the aim is to reduce the per capita carbon footprint by 40% through more economical energy usage, less car usage and use of construction materials that are certified products from renewable forest. “With all the ongoing initiatives, we are confident the synergistic transformation of Sime Darby Property will not only create the largest but the best property company in the country,” Badlishah says. PETALING JAYA: Emkay Group plans to develop in Damansara Perdana a project on a 9.2ha site which will offer four million sq ft of built-up space. From left: Tan Sri Mustapha Kamal Abu Bakar, Bank Rakyat managing director Datuk Kamaruzaman Che Mat and Petaling Jaya City Council Mayor Datuk Mohamad Roslan Sakiman at the launch WAN’s Avenue @ Neo Damansara. Chairman Tan Sri Mustapha Kamal Abu Bakar said the plan was now awaiting approval from the authorities. “I can’t give much details at this moment but the development will focus on commercial properties that involve corporate offices,” he said yesterday after the launch of WAN’s Avenue @ Neo Damansara in Damansara Perdana. Mustapha said the company also planned to sell some of its land as it had about 3,200ha. “We may sell or enter into a joint venture with other companies to develop our land-bank as it is too big,” he said, adding that the property outlook was improving based on the sales performance of its listed company, MK Land Holdings Bhd. “An investor had just bought 178 units of Block C at our Armanee Terrace condominiums. This is a big sign that the property market sentiment is picking up again. Our focus now will be on our core products, which consist of The Rafflesia, Armanee Terrace condominiums and Metropolitan Square at Damansara Perdana, to enhance our profit,” he said. Neo Damansara, with a gross development value (GDV) of RM587mil, is divided into three phases and is scheduled for completion in 2013. Situated on 3.04ha, the first phase – WAN’s Avenue – with a GDV of RM100mil, has already been sold and handed over to the buyers. Phase two will consist of one tower block of 374 serviced apartments with an estimated GDV of RM270mil, while the final phase will see a corporate office tower and an eight-storey building with a GDV of RM177mil. Paradigma Intan Sdn Bhd, a subsidiary of Emkay, is the developer and this is its first project. The Emkay group of companies, controlled by property tycoon Tan Sri Mustapha Kamal Abu Bakar, expects the local property market to pick up soon, judging by the response to its recently launched condominium block in Damansara Perdana, Selangor. "A private investor bought Block C of the Armanee Terrace condominium development, which features 178 units. This showed that investors have confidence in the Malaysian property market. The market is good with funding available," Mustapha Kamal said after launching Wan's Avenue at Neo Damansara in Damansara Perdana yesterday. "Sales of (properties by) Emkay and (associate firm) MK Land Holdings Bhd has been rising and we will continue to focus on projects such as Neo Damansara, Rafflesia, Armanee and Central Square." Mustapha Kamal also said the group will sign an agreement with a university in two weeks to lease 2,000 units of its condominiums to undergraduates. Meanwhile, Emkay has no plans to buy new land to beef up its landbank but would sell its own land, of which proceeds will be used to develop and finance its own land at another strategic locations to hasten its own speed of development. "We can develop our landbank either on our own or on a joint venture basis," said Mustapha Kamal. The group owns some 2,868ha of land in the country, while MK Land holds another 3,239ha, which will keep the group busy for the next 10 years. Meanwhile, Neo Damansara is the first commercial project by Paradigma Intan Sdn Bhd, a subsidiary of MKN Group Sdn Bhd. Spanning 3ha, Neo Damansara has a total gross development value of RM587 million and features 1,087 units of shop offices, show rooms, an office tower and a food and beverage plaza. The development is due for completion in 2013. Neo Damansara is divided into three phases, with Wan's Avenue being Phase One. Already, all 84 units of its shop offices have been sold out. Phase One also sees the construction of a 12-storey building, comprising 84 units of shop offices, penthouse suites, office suites and retail shops. KUALA LUMPUR: Selangor Dredging Bhd (SDB) plans to launch more luxury condominiums in Singapore after its maiden project there, comprising 22 luxury condos at Wilkie Road, received good response and drew in sales worth RM163mil. “We do have projects in the pipeline for Singapore,” managing director Teh Lip Kim said at the company AGM here. The former tin mining company recently acquired a piece of land in the Newton Circus area of Singapore and is in the works to build 110 luxury condos. The project was expected to generate a revenue of RM450mil for the company, Teh said. While there are no immediate plans to expand property development beyond Malaysia and Singapore, Teh did not rule out the idea, citing the recovery in regional propert markets. On SDB’s controversial Damansara 21 project in Kuala Lumpur, chairman Eddy Chieng confirmed that the stop-work order issued by City Hall had not been lifted. The hillside construction of 21 luxury bungalows at Damansara Heights drew protests from the public due to concerns over its enviromental impact on surrounding areas. Chieng dismissed fears that the project might cause landslides, claiming that Damansara 21 was benchmarked against standards in Hong Kong, which has many hillside developments. “We have fully complied with the Government’s recent guidelines regarding hillside developments, and we are just waiting for further approval,” he said. SDB reported a net profit of RM17.24mil on turnover of RM164.07mil for the year ended March 31. PROPERTY developer Selangor Dredging Bhd expects to launch several developments totalling RM400 million to RM500 million in gross development value by the end of its fiscal year ending March 31 2010. The developments include two remaining blocks of its Five Stones condominium development in SS2 in Petaling Jaya and a 33-storey high-rise condominium in Singapore. "To actively manage the soft property market, we have rescheduled some of our launches such as the Five Stones development," its managing director Teh Lip Kim told reporters after the group's annual general meeting in Kuala Lumpur yesterday. It has brought forward the launch date for the two remaining blocks of the Five Stones development from the middle of next year to the first quarter. Five Stones comprises five blocks, with three blocks launched last week. It has already sold 70 per cent of the 185 units. "We are also resizing some of our units in other property projects. Some of our layouts were relatively big and we have decided to decrease the size," she added. For instance, the 33-storey condominium project located near Newton Circus in Singapore has been re-planned to house smaller units. This development, to be launched either by year-end or the first quarter of next year, will now have 110 units, instead of 66 units. Selangor Dredging's unbilled sales from recent launches, including Five Stones and another Singaporean development, Jia, stand at RM235 million. The group saw its fiscal first-quarter earnings dip because of lower sales recorded by the hotel operation due to the Influenza A (H1N1) virus. Selangor Dredging owns and manages Hotel Maya in Kuala Lumpur. Net profit for the three months to June 30 2009 dropped 62 per cent to RM2.7 million, while its revenue declined 24 per cent to RM48.7 million. "The last quarter was bad because all our overseas guests were mainly from Europe, Australia and the US, and they basically stopped travelling. In addition, MNCs (multinational corporations) froze their corporate travels, so we had many cancellations," said Teh. However, there are signs of improvement for the hotel operations in the present quarter, he said. PROPERTY developer Eastern & Oriental Bhd (E&O) plans to launch RM4 billion worth of properties over the next three to four years, as the local economic and property market conditions improve. Of the total, half will be launched in Penang and the rest in the Klang Valley. "Six to nine months ago, everyone was cautious in some ways and sceptical about buying in the high-end market. "But based on our experience and performance in Penang and Kuala Lumpur over the last three months, we believe we can still continue to launch (properties) and expect good response at least for the rest of the year," said managing director Datuk Terry Tham after the company's extraordinary general meetings in Kuala Lumpur yesterday. "So far, as far as our launches are concerned, we are fortunate that all of our them have been well received, with at least 80 per cent of the properties sold," he added. Tham said the company may hasten its launch of the RM4 billion worth of properties to two years, if the market recovers faster than expected. E&O, which received shareholders' nod to raise some RM200 million via a rights issue yesterday, plans to raise another RM300 million internally. "We are looking at disposing of inventories and non-strategic landbank. So far, we have raised some RM100 million through these initiatives," said executive director Eric Chan. Proceeds from the RM500 million fund-raising could be used to increase cash flow, lower gearings, as well as for expansion. E&O expects to raise the funds over the next 18 months. E&O's net gearing, which as at March 31 stood at 0.79 times, could be lowered to as low as 0.16 times via the fund-raising. KUALA LUMPUR: Property developer Eastern & Oriental Bhd (E&O), which is looking to raise RM200mil from a 1-for-2 rights issue slated to be completed before the year-end, is targeting to launch RM4bil worth of properties in two to three years. Managing director Datuk Terry Tham said about RM2bil worth of projects would be launched in the Kuala Lumpur central business district and the balance in Penang. He said most of E&O’s current projects had good take-up rates, despite the tough economic environment. “On average about 80% of our property projects have been taken up,” he said after the company EGM yesterday. He said E&O’s fund-raising exercise would help the company take advantage of the opportunities that might arise in the next economic upturn. The fund raised would have a coupon of 8% per annum, and irredeemable convertible secured loan stocks (ICSLS) holders have the option to convert to E&O shares any time within the 10-year tenure to take advantage of any upside in the share price. Also, the ICSLS are secured against the assets of the E&O group to mitigate the risk for holders in the event of a default. He said it was important for E&O to strengthen its balance sheet before embarking on an expansion. Currently, E&O has cash reserves of about RM300mil. Tham said in the past three months the property market, especially the high-end category, had shown early signs of recovery. PROPERTY developer Metro Kajang Holdings Bhd will partner Selangor State Development Corp (PKNS) to develop an integrated project on a 2.4ha leasehold land in the city centre in Kajang, Selangor, for RM500 million. Group senior general manager Chong Yong Han said the project, dubbed "Kajang Walk", will feature a three-star 300-room city hotel, a retail mall and offices. Chong said the properties will have a gross built-up area of 1.5 million sq ft and both Metro Kajang and PKNS will jointly promote them to investors in Asia-Pacific, including Malaysia. "This is our first venture with PKNS and we hope to work together on other potential developments," he said at a signing ceremony in Shah Alam, Selangor, yesterday. The event saw Metro Kajang college operator Andaman Group and Q-Cell, a Germany-based solar-cell manufacturer inking agreements with PKNS to develop land at the latter's 400ha Selangor Science Park 2 (SSP2) integrated project in Cyberjaya. PKNS general manager Othman Omar said he believes that the synergistic relationship between PKNS and Metro Kajang will benefit both parties. SHAH ALAM: Selangor State Development Corp (PKNS) has attracted RM3.8bil worth of investments via three investors for its Selangor Science Park 2 (SSP2) that is under development in Cyberjaya. The investors are Q-Cell from Germany, the Andaman Group and Serba Sentosa Sdn Bhd, a wholly-owned subsidiary of Metro Kajang Holdings Bhd. SSP2 is a 1,300-acre mixed development project with gross development value of RM3bil which is expected to be completed between 10 and 15 years. PKNS general manager Othman Omar said Q-Cell, the largest manufacturer of solar wafer and cells in the world, had started operations in SSP2 in May. “The company is also collaborating with us to energise PKNS Gallery in SSP2,” he said yesterday after a memorandum of understanding signing ceremony with the investors, witnessed by Selangor Mentri Besar Tan Sri Abdul Khalid Ibrahim. Q-Cell plans to take up to 100 acres in SPP2 which will involve investment of about RM3bil. The Andaman Group will develop another SEGi College campus, estimated to cost RM300mil. It had developed a similar campus in PKNS’ earlier project, Selangor Science Park 1, in Kota Damansara. “Metro Kajang will collaborate with PKNS to develop our commercial and residential area in SSP2. “In return, PKNS will jointly undertake a commercial development with Metro Kajang in Kajang town centre,” Othman said, adding that the land belonged to Metro Kajang. Metro Kajang’s project in SSP2 will involve an investment of about RM500mil. Going forward, Othman said PKNS was in serious talks with local and foreign investors to invest in SSP2. “We want our investors to be in line with the SSP2 concept of high-technology and environment-friendly industries,” he said. SSP2 would be a low density and sustainable development, with over 20% of the area reserved for green areas and public parks. HUA Yang Bhd’s wholly-owned Grandeur Park Sdn Bhd has bought 140.87 acres planted with oil palm in Pulai, Johor, for RM35.15 million from two vendors. It plans to turn the land into a mixed commercial and residential township with estimated gross development value of RM350 million, Hua Yang said. The opening of Malaysia's first Hard Rock Hotel in Penang next month is set to generate up to RM10 million for the island-state's economy. Hard Rock Hotel Penang general manager John Primmer said the figure includes wages and spin-offs to local businesses, including transportation companies and an estimated 100 local vendors. "We are planning to open three Rock Shop merchandise outlets (in the hotel), offering 150 items from t-shirts, caps, pins to Hard Rock souvenirs, and expect up to RM4 million in revenue from the sale of these items during our first year of operation," he told Business Times. "These outlets are located at different parts of the hotel and each shop carries a different range of items," he said, adding that the Rock Shop by the main driveway to the hotel will allow convenience and access to the public who are not hotel guests. The RM150 million Hard Rock Hotel Penang will open its doors on September 19 and has created over 200 jobs. "Due to the brand and the concept of the hotel, we are looking at young information technology-savvy couples (30 per cent), families (30 per cent), older rockers (20 per cent), and the meetings, incentives, conventions and exhibition market (20 per cent) in terms of the markets we are targeting," Primmer said. 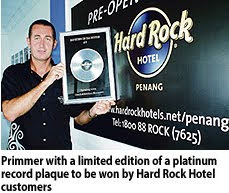 He added that while the concept that the Hard Rock brand carries remains, what makes the Penang property unique is that it will be the first Hard Rock Hotel with a beach front in the world. "At the same time, it adapts a modern concept compared to the existing Hard Rock hotels outside of the US," he added. The first Hard Rock Hotel in Asia opened in Bali, Indonesia, in 1998, followed by one in Pattaya, Thailand, in 2001. The Penang property will be the 10th Hard Rock Hotel worldwide.